COCOA BEACH, Florida -- Just after noon today, a shark approximately 5 feet long swam into less than 3 inches of water near where a large group of young children were playing in the sand. The lifeguard was later joined by other lifeguards calling swimmers out of the water just south of the Cocoa Beach Pier to avoid the shark. As seen in the video below, a bystander gives Cooney a pat on the back for a job well done. The beach was crowded more than usual today due to the Space Coast Super Boat Grand Prix. According to his family's website, cooneyworldadventures.com, Cooney's parents "sold virtually everything they owned to take their three teenage sons on an around the world trek," in 2008. Cooney appears to be a Steve Irwin "The Crocodile Hunter" of sorts during his globe trotting adventures. Many of his Facebook photos show him straddling alligators, elephants, and posing right next to an uncaged lion. "The lifeguard that moved the shark is certified to handle alligators, so he was the obvious choice to safely mitigate the situation," said Brevard County Fire Rescue spokesperson Donald Slayman. 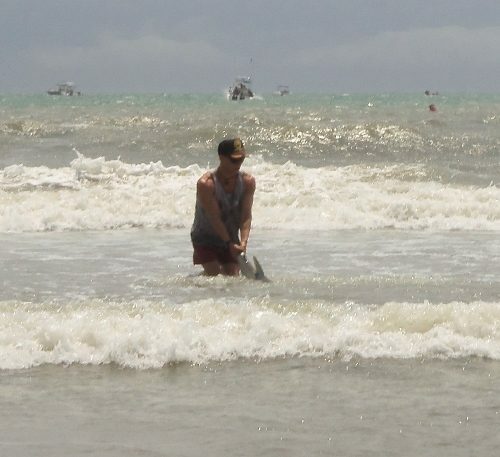 As reported by Brevard Times in its surf report over the last few weeks, small sharks have been spotted chasing bait fish into the shallow surf. Brevard County surpassed Volusia County as the #1 county in Florida for shark attacks. 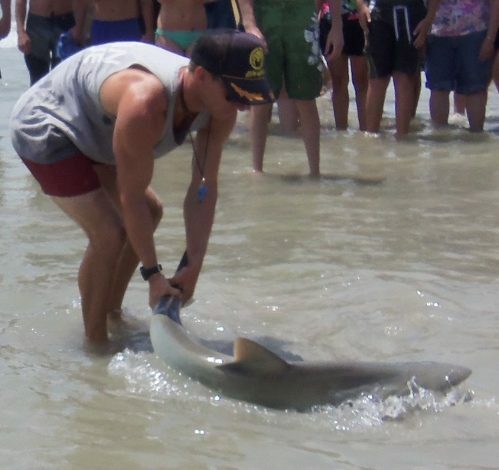 Florida remains the #1 state in the U.S. for shark attacks.